Just like people, electrons prefer to be in low-energy states. For us, that means crashing on the couch with Netflix after a long day. For electrons, it means finding an element with a lower reduction potential and jumping ship. How many people are going? Is the crowd too big or too small for your comfort level? How close are these friends? Will your night be filled with inside jokes—or awkward silences? How strong is the movie’s attraction? Is it better than the shows you could be binge-watching? The same factors determine how much an electron wants to stay put, or how much it’s dying for a change in location. How many electrons are in the valence shell? Elements are most stable when they have a completed “octet”—eight electrons in their outer valence shell. How close is the nucleus? Opposites attract, and electrons are negatively charged while nuclei are positively charged, so they attract each other. But that attraction decreases with distance, so the closer electrons are to the nucleus, the tighter the electrons will be held. If there are a lot of electron layers between the valence electrons and the nucleus, the electrons have an easier time skipping out. How strong is the nucleus’s attraction? Nuclei with a lot of protons (higher atomic numbers) are stronger than less positive nuclei, but that effect weakens once another layer of electrons is added. If there’s a positive charge on the atom or compound, it also makes it harder to remove the electron, because the positive charge draws electrons in closer. If you have a high-energy, unstable electron that really wants to bail and another element nearby that has a nice, cozy, low-energy valence electron spot just waiting for it, what do you think will happen? The electron will jump ship and head for the lowest energy state, burning off extra energy in the process. But how do you know which element will gain an electron and which will lose one? You can usually figure it out by looking for an octet, close nucleus, and high positive charge, but fortunately, you don’t have to calculate this every time. Scientists have tested dozens of elements and have determined their relative desires to gain an electron (called “reduction”), and, conversely, remove an electron (“oxidation”). “Activity tables” show the relative reduction potentials of each atom so that you can tell if it takes more energy, say, to turn iron 3+ into iron 2+ than it does to turn hydrogen + into elemental hydrogen (the standard for reduction potentials). Electrons will always leave an atom with a high reduction potential to go to an atom with a low reduction potential. This process may even give off extra energy because the electron makes them so stable, usually by completing an octet. When one element is reduced and another is oxidized (and they always go together), it’s called an oxidation-reduction or “redox” reaction. How do you know a redox reaction has taken place? In most of chemistry, we know a reaction has taken place if a bond is made or broken. But in electrochemistry, a redox reaction has taken place if an electron has been transferred from one atom to another. This process powers everything from batteries to electroplating and can power energy-intensive processes. Most of the time, electrons are gained and lost by metals, because those are the easiest to oxidize and reduce. So if you see a compound with a metal in solution, check its oxidation potentials and compare it to the other reactant. Does one need more electrons? Does one have electrons that are easily given up? If both are true, you might be looking at a redox reaction. If all the atoms have enough electrons (or none to give up), then a redox reaction will not take place. Once all electrons have been transferred, you can figure out what will happen with the rest of the reactants in the solution and balance the equation. Sometimes, the counter ions will switch from one place to another to balance the charge, producing different amounts of product. You’ll need some stoichiometry to figure out exactly how much. It’s also important to know the rules for assigning oxidation states in order to make sure you’ve identified the correct potential (removing one electron from sodium is much easier than removing two!). But once you know how to figure out whether an electron is ready for a big night out with its atomic friends or if it would rather stay in, you’ll be well on your way to some fascinating electrochemistry. 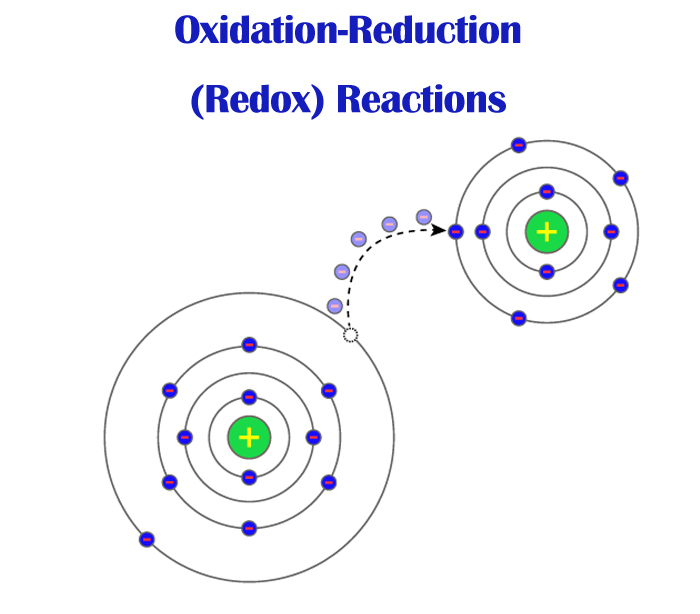 For more information check out the Oxidation-Reduction (Redox) Reactions lesson in our AP Chemistry course or Electrochemistry lesson in our General Chemistry course. Previous What is Organic Chemistry? Next Electrochemistry: More Powerful than Thor!